Q: My dog or cat is black, will his picture show up on black granite? Q: What is the best way to send my pet's photo? Q: I don't have my pet's photo on my computer...can I just send it in the mail? A: Yes, absolutely. Contact me and I'll send you my address. clear, in-focus with good contrast. close up is better than far away. shadows across your pet's face are sometimes a problem. in most cases the background will be removed . color or Black & White photos are both good. I recommend you submit your "favorite" picture of your pet. If your "favorite" photo is no good for etching I'll let you know and we can select another. if you are not sure about something feel free to email the photo and I'll take a look. A: No problem, I can fix most eye problems. Q: How deep is the laser etching into the granite? A: Laser etching is not very deep, it consists of tiny dots permanently lased or blasted into the surface polish of the granite. Tiny dots make it possible to achieve the detail & contrast that reproduces an exact copy of an image at 200+ dpi. Laser etching is not "traditional engraving" or "sandblasting" that most all of us are familiar with. It is a relatively new technology that the monument industry has embraced. You can Google "laser etching" to read more about it. Q: How long will the laser etching last? Q: Do you do custom projects? 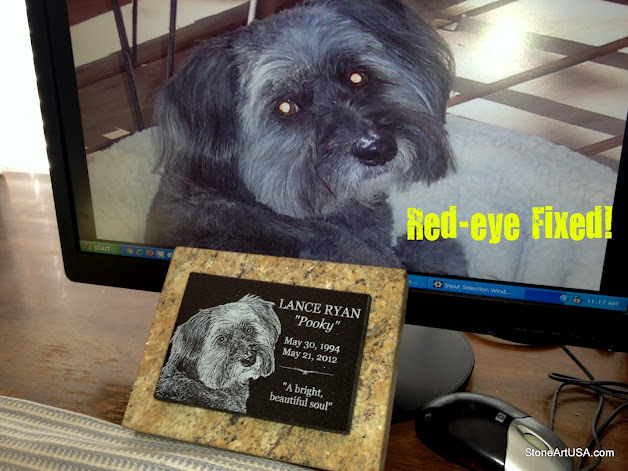 A: Yes, I do address plaques, awards, custom coasters, dedication plaques, signs, etc. Send me an email and we can discuss your project. Q: How are your stones shipped? A: Memorials are packaged to withstand the punishment of travel. Depending on the size and weight I will ship either USPS or FedEx. Tracking info. will be sent to you. 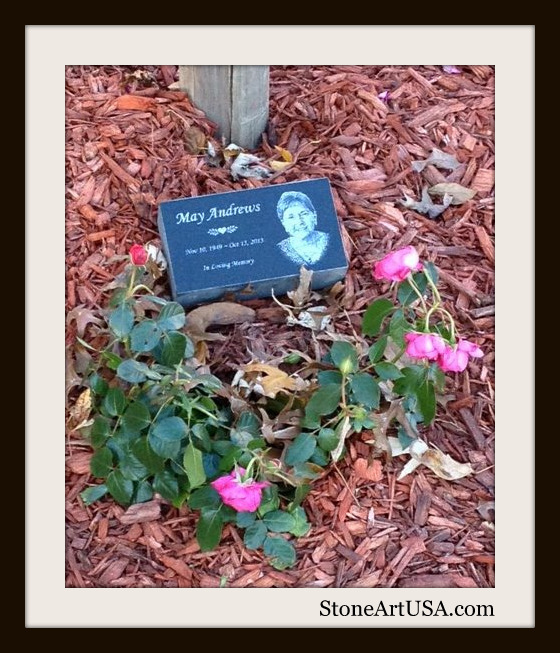 Q: What if my memorial arrives damaged? A: In the unlikely event your stone arrives damaged you do not need to worry about a claim with USPS or FedEx, I'll do that for you. I do ask that you contact me immediately, save all packaging material and email me a few pictures of the damaged stone and it's box. I will make and ship a new memorial immediately at no cost to you. Q: Does StoneArtUSA make gravestones for people? A: Yes, please contact me and I will provide you with more information. etching a black pet on black granite? a black pet can be laser etched on black granite. 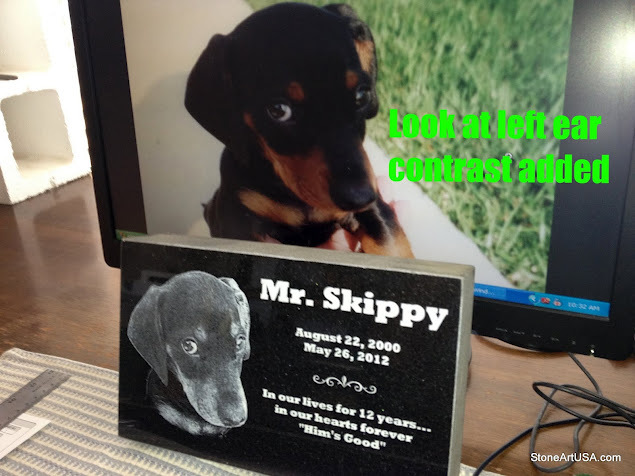 Mr. Skippy on a 6x10x2 Flat Granite Pet Marker. Any stone can be designed for any Loved One.